home > Bradbury > Coffee Bar specification. Capacity of Coffee Bar combined with the Meeting Room. Data projector or plasma screen. Width at widest point - 6.25 metres (20 feet). Width at narrowest point - 4.5 metres (14 feet). Length - 10.42 metres (34 feet). Height at the apex roof - 5.6 metres (18 feet). Height at the flat roof - 2.41 metres (8 feet). Floor area - 53.66 square metres (577 square feet). Access from the street is via 2 sets of double doors at right angles to each other. The maximum access size is 1.38 metres wide x 2 metres high. Access from the Main Hall is via a double set of doors. Access from the Meeting Room is via a wide folding partition wall. Access for the Church is via a wide folding partition wall and a metal shutter to give increased noise separation. The number of people allowed in the Coffee Bar depends on the use and the risk assessment carried out for the event. Please do not invite the maximum numbers to your event until we have agreed that your event will comply with safety regulations. The building fully complies with all safety regulations regarding emergency exits and fire alarms etc; The risk assessment will centre on how you will get people out and away from the building in the event of an emergency. For example it may take longer to get people out in wheelchairs or prams than a youth group. We will be able to help you with this. Social gathering with everyone standing - 80. ‘Coffee Morning’ layout with 6 x tables (700 mm x 700 mm) - 40 sitting and 30 standing. Theatre Style with everyone seated in rows - 54. Social gathering with everyone standing - 90. ‘Coffee Morning’ layout with 6 x tables (700 mm x 700 mm) - 40 sitting and 40 standing. Theatre Style with everyone seated in rows - 60. For every extra table (900 mm x 600 mm) used - reduce numbers by 2. For every extra table (1830 mm x 6760 mm) used - reduce numbers by 4. The Coffee Bar and the Meeting room can easily be converted into one large area by opening the folding partition wall. Social gathering with everyone standing - 130. 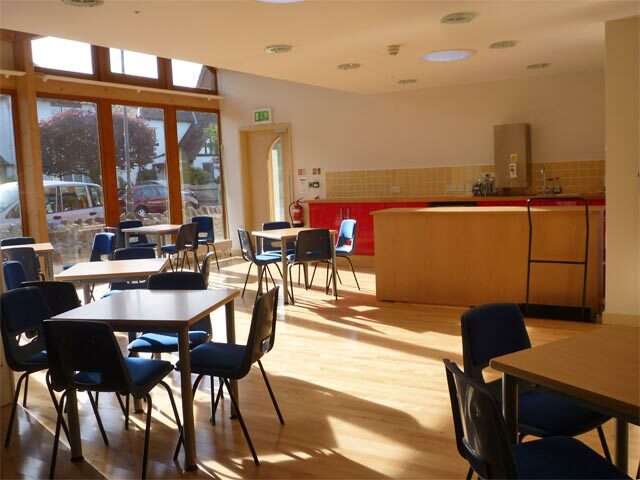 ‘Coffee Morning’ layout with the included 11 tables and 62 chairs - 62 sitting and 58 standing. Theatre Style with everyone seated in rows - 84. There is a Wi-Fi Broadband system in the Coffee Bar - password controlled. 24 x lightweight plastic stackable chairs with padded seats and backs are provided. 12 additional chairs can be brought in from the church foyer on request. 6 x Heavy duty tables (700mm x 700mm) with imitation light oak tops are provided. Additional tables of a larger size can be provided on request. Full coffee making facilities are provided, but we do not provide the milk or coffee! There is an automatic water heater capable of providing instant hot water for up to 150 mugs of tea or coffee or 180 per hour. There is a dish washer with a 2minute wash cycle. Selection of cutlery, plates and bowls for serving biscuits and snacks. Hot water is available at the sink for the occasional washing of dishes but we would prefer you to use the dishwasher at all times. A suitable First Aid Kit is supplied. We can arrange catering for your event from just coffee or a buffet lunch to a full sit down meal. Fluorescent lights to provide general lighting. Concealed fluorescent lights to up-light the ceiling. 3 x low voltage spotlights to create mood lighting. There are 5 preset lighting states and an overall raise or dim feature. The lighting can be controlled from any one of 3 positions. The Coffee Bar does not have an Induction Loop system. There are two other loop systems in the immediate area which can affect the space with cross talk. A sound system is not supplied and should not be needed for a typical lecture or demonstration. The Coffee Bar is not fitted with a Data Projector or a Plasma screen but we can easily arrange the supply of these. If the Coffee Bar is used with the Meeting Room then a larger audience can be accommodated using the Plasma Screen in the Meeting Room. There are 5 x Double and 1 x single 13amp Socket Outlets positioned around the Coffee Bar. Heating is provided via conventional radiators which will maintain a constant temperature of 20°C. The heating, if required, is automatically activated upon first entry to the Coffee Bar. There is a manually operated window. There are sets of Venetian blinds on the long windows that will obscure the view. The Coffee Bar cannot be blacked out completely using the fitted blinds.